Wis. Political Split Hardens Into Great Divide No state may be more polarized right now than Wisconsin. That follows the effort by Republican Gov. Scott Walker to eliminate the collective bargaining rights of most public workers there. The gap is most apparent between Wisconsin's biggest cities and its smallest towns. 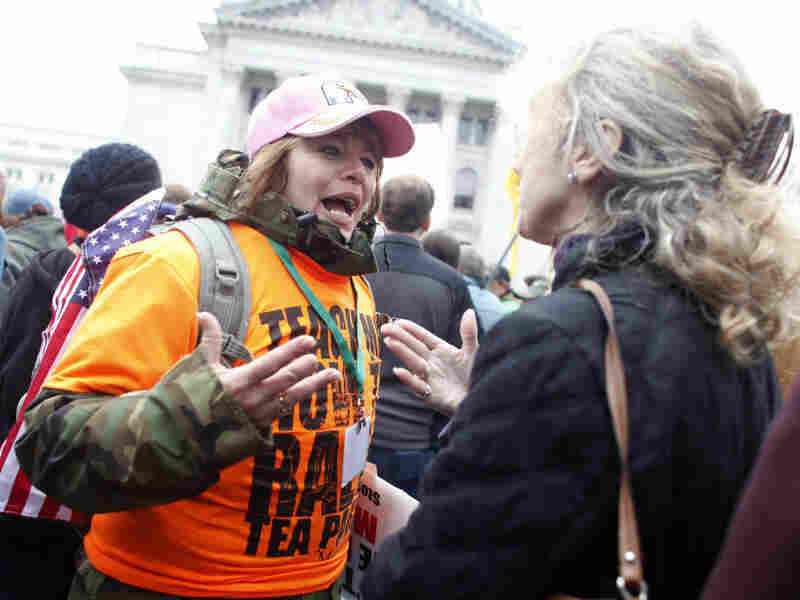 A Tea Party supporter, left, argues with a critic before a rally where former Alaska Gov. Sarah Palin spoke at the Wisconsin State Capitol in Madison on April 16. No state may be more politically polarized right now than Wisconsin. That follows the effort by Republican Gov. Scott Walker to eliminate the collective bargaining rights of most public workers there. The divide is most apparent between Wisconsin's biggest cities and its smallest towns. Wisconsin is one of those rare states that seems to go back and forth between electing Democrats and Republicans almost every cycle. President Obama won it by a wide margin in 2008, but then the state flipped dramatically last year with a near Republican sweep — and last month's state supreme court election was so close, votes are still being recounted. "Wisconsin is not just a battleground state, Wisconsin is not just a divided state, but we're literally a 50-50 state," says Mordecai Lee, a former state lawmaker who's now a professor of Governmental Affairs at the University of Wisconsin-Milwaukee. "It's almost like Wisconsin is so evenly split that there must be one little old lady who tilts our elections one way or the other, I mean, that's how close we are," he says. "It's just unbelievable." The battle over collective bargaining is hardening views in the state that gave birth to the nation's first public unions. It's clear Wisconsinites are taking sides. University of Wisconsin-Madison political scientist Kathy Cramer Walsh says voters here have always had their disagreements, "but Wisconsinites, in general, are good at sort of smoothing over differences and getting along. And right now we're not getting along, and it's blown out into the open. I'd say it's pretty different. It feels un-Wisconsin-like to me." Like most states, Walsh says Wisconsin has always had its urban-rural divide. Many in the state's picturesque small towns believe that their tax dollars go to Madison to stay or are diverted to Milwaukee — and they resent it. But add to that the continuing economic struggles in rural areas — as factories shutter and jobs disappear — and Kathy Walsh says there is growing anger with public employees. "Good salaries and benefits and health care, in particular, are something a lot of people in a lot of places in Wisconsin don't have," she says. "So there's just a lot of resentment toward public employees." In the small town of Milton near the Illinois border, Ron Sowles embodies that resentment. "I think those people are out of touch," he says. "Those people in Madison and people that are educated in liberal colleges and our schools are very liberal. And I don't think they're really in touch with the real world." Even though he's in a union, working for the Rock County rural electric co-op, Sowles says he and many others here support Gov. Walker taking on the public unions. "They expect everybody to get something for nothing and real conservatives are out working for their wages, working for their benefits, and I get a little tired of paying for everybody else's retirements, too. They need to pay a little bit for themselves," he says, "and I think what Scott Walker is doing is absolutely right." But Richard Eddings says he doesn't think people in small towns are all that different from those in Madison. The retired state employee says many here disagrees with Walker and he doesn't care for the governor's autocratic style. "I think that we have to go back to rule by the people and we don't have that right now," he says. "It's very, very partisan. You're either Republican or you're Democrat and nobody's talking to each other." That's a very sad change for Wisconsin, Eddings says. "I've lived in Wisconsin all my life and I used to be really proud of this state." While many Wisconsin liberals are quick to blame Walker for provoking the bitter collective bargaining fight, conservatives blame the Democratic senators who left the state and the massive protests in Madison for souring things. Regardless of who's to blame, Colleen Vierck of Milton says this new divisiveness in Wisconsin has real casualties. "I know my son has a good friend who's very pro-Walker, and the two of them are like, you know, at each other all the time. They just can't, they can't talk anymore. They were best man at each other's wedding and they're having a very difficult time with it." With the collective bargaining law still in limbo in the courts, and recall elections likely against state senators in both parties this summer, this divisive political friction in Wisconsin is only likely to get worse.